Managing your fleet is a big job. But, it doesn’t have to be difficult. 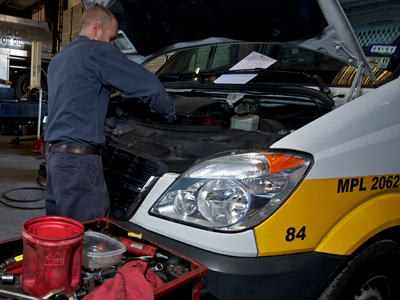 Ferguson Truck Center provides support custom-tailored to fit your needs. Whether managed by mileage or calendar, we help make your big job easy to manage. Ferguson Truck Center has a variety of standard PM programs to help you keep your fleet running smoothly. We can also work with standardized company plans to keep you in compliance with corporate mandates. OPTION A: A comprehensive bumper-to-bumper dry inspection. OPTION B: A full inspection that goes beyond the dry inspection to include checking and changing fluids where appropriate. Tell us a little more about your maintenance needs. We’ll follow up with information on how you can make managing your fleet easy as calling Ferguson Truck Center.